CROSBY  According to the Crosby Volunteer Fire Department they were called to the Crosby Plaza Apartments at 4:47 a.m. on Tuesday. Upon arrival flames shot from the apartment office, the laundry room and adjacent apartments. It seems that at least four apartment homes were destroyed by the blaze in addition to the office and laundry room. As fire fighters arrived several gas lines exploded. Indications are that the most burned area was the laundry room where live powerlines entered the building. The fire fighters had to have CenterPoint Energy come out and shut down the gas to the laundry room before effective fire fighting could begin. 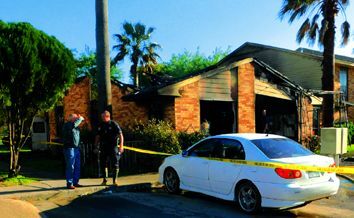 Harris County Fire Marshals arrived sometime after 5:30 a.m. and were still conducting investigations at the scene until about 11:30 a.m. They say the fire is still under investigation. Witnesses say there had been a man shouting that he would burn the place down if they did not put him up somewhere on Monday. But, authorities have yet to confirm that information or that the man had been living in a unit for two weeks. Neighbors and fire fighters took as their first task to evacuate those in the path of the fire. Due to those efforts, no one was hurt. Crosby ISD had expressed concern for the children living in the apartments even before the fire, Many families have lost their homes. We have been in contact with many of the families affected by this mornings fire. The Red Cross has also been on site to assist the families temporarily. Many others have asked how to help. At this time, we are asking that donations be taken to CUIC here in Crosby, located on Church Street so that we have a central location for donation collection and distribution. Children can visit the Easter Bunny in his springtime garden at San Jacinto Mall March 25 through April 15. Festive face painting and balloon art will be available March 25 from 12pm to 1:30pm near Bath & Body Works. Photo packages start at $24.99. Kids will receive a complimentary activity book for visiting the Bunny! The Easter Bunnys hours are available on the malls website. In addition, kids can visit www.SanJacintoMall to experience Bunnyville, featuring interactive games and educational activities centered around the Easter Bunnys village, which includes a workshop, library, post office, school, art studio, train station, boutique, clubhouse, photo studio, internet café, weather station and candy shop. San Jacinto Mall is located at I-10 at Garth Road in Baytown, Texas. For more information, call (281) 421-3908 or visit www.sanjacintomall.com. San Jacinto Mall, located in Baytown, Texas, is owned by Fidelis Realty Partners. The shopping center is anchored by Macy’s, JCPenney and Sears. Guests have more than 80 retailers and restaurants to enjoy, including Bath & Body Works, Journeys, Champs, Foot Locker, Footaction, Icing, Visible Changes, Zales, Payless Shoe Source and Merle Norman. Entertainment options include Bungee Jump, Power Play Arcade, Premiere Cinemas 11 and South Mountain Kiddie Rides. The shopping center hosts various community events throughout the year. For more information and a complete list of stores and restaurants, please visit www.sanjacintomall.com.